If you don’t already know him, let me introduce you to Harish N. Kotecha, a Hindu community leader here in Central Texas. He’s agreed to be my guinea pig in my effort to improve religious literacy through short Q&As with people of different belief systems. These will be small snapshots into world religions (and atheism) with the hope that we might learn something new, correct a misconception or two and even be inspired to pursue more knowledge on our own. It made sense to me to start with the oldest religion — Hinduism — and to call on one of the nicest and hardest working faith leaders in the Austin area. A bit about Harish: He was born in Uganda and lived there until dictator Idi Amin abruptly expelled the country’s Asian population in 1972. Harish and his wife Shobhna fled to the U.S. where Harish worked for IBM as an engineer/manager. 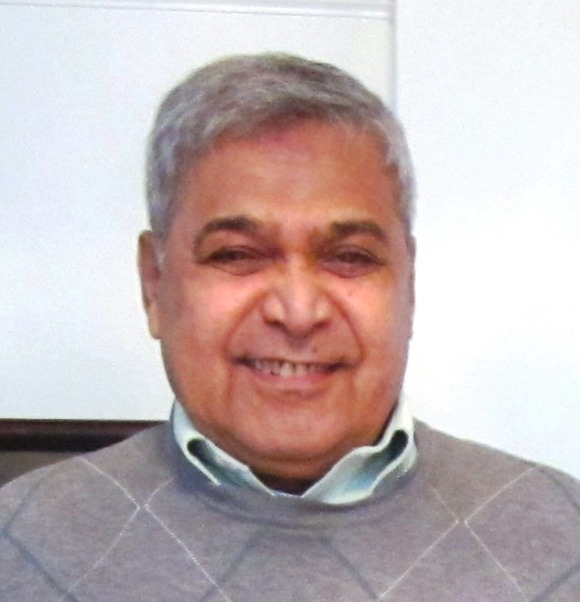 Now retired, he’s devoted himself to community, helping to develop Hindu temples and leading/participating in various civic and cultural organizations. He energized the Hindu community in Austin to help with the resettlement of Bhutanese refugees in recent years and remains committed to resettlement efforts. In 2010, he founded Hindu Charities for America “with the vision of motivating the Indian communities across U.S. to help with education of homeless and other economically disadvantaged children.” As Harish sees it, this country has given him a home and prosperity, and he wants to give back. Harish and Shobhna have a daughter, Sonia, who works for CASA in Travis county, and son, Savan, a successful songwriter. You are very active in getting the word out about the Hindu community in Central Texas through your charitable and interfaith work. What should we know about your faith community? By and large, the Hindu community of 15,000 to 20,000 in Austin is mostly educated, economically well off and fairly traditional. There are six large places of worship and various cultural and civic organizations that are helping keeping the culture alive. It is said that UT at Austin typically had three to four thousand Hindu students while the Indians in Austin are doctors, lawyers, engineers, IT experts, entrepreneurs, and employed in companies in a professional capacity. The culture and traditions are deep rooted and the ties with India are strong for many. There is a focus on education of the children. A friend of mine recently dedicated herself to Sanatana Dharma under the teacher Sri Acharyaji. We’ve been talking about her spiritual practice quite a bit lately, and it’s got me wondering about labels. She doesn’t call herself a Hindu or refer to her belief system as Hinduism given the non-Vedic origin of these terms. How do you feel about these labels? As I understand it, Sanatham Dharma or “the eternal truth” is the oldest religion and not founded by one person. There are four Vedas, the Rig Veda, Sama Veda, Yajur Veda and Atharva Veda. The Vedas are the primary texts of Hinduism. They also had a vast influence on Buddhism, Jainism, and Sikhism. Traditionally the text of the Vedas was coeval with the universe. Scholars have determined that the Rig Veda, the oldest of the four Vedas, was composed about 1500 B.C., and codified about 600 B.C. It is unknown when it was finally committed to writing, but this probably was at some point after 300 B.C. Just as have we have teachers or trainers to acquire various skills, in Indian culture, to learn and practice religion, religious teachers (Gurus, Swamis, etc.) are common. People follow the one they feel comfortable with. Fundamentally, we all understand truth is one, but there are many paths to learn truth and there are many names give to the same truth. God is one; there are many ways to realize God. For example, Harish is one, but people know him as husband, father, employee, friend, social worker, etc., depending on the role he plays on the screen of life. Similarly there are different forms of the one and same God. Given the multiplicity of religious teachers and religious practices, labels develop – it is human nature. Better understanding is reached from teaching of writings of those understand. Sri Pravartak Acharyaji’s teaching appears to evolve from Vedas and Hinduism. Many will say that Hinduism is a way of life, not a religion. There was an interesting article in Newsweek by Lisa Miller that is titled: We are all Hindus – Hinduism, as some maintain, is a way of life. Hinduism is the most challenging (in a good way!) religion I’ve studied. It is ancient and complex with such a wide range of beliefs and practices. I think Westerners have a lot of misconceptions about the religion. I’m sure you have a long list to choose from, but can you give me just a few examples of what people in the West get wrong about Hinduism? Hinduism is a Polytheistic religion – meaning there is a belief in many Gods. This is untrue – Hindus believe there is one God, but there are many paths to realize God. It is the only religion in the world in which a person is given the freedom to choose to relate to God in the way that suits them best, whatever that may be. Hinduism has thousands of Gods: Hindu scriptures state that there are many divine/spiritual beings in the universe – It has been interpreted to mean that there are many Gods. This was most likely never intended to be taken literally, as the Hindu scriptures are full of symbolic metaphor and esoteric meaning. Hinduism supports the caste system: Caste system came about not though Hinduism but by people who looked down on others. It unfortunately became part of Indian culture and got related to religion. Along those lines, what is the most challenging aspect of being part of a minority religion here in Texas? The most disturbing thing from my experience has been conversion of Bhutanese Hindu refugees to Christianity. These folks came in as refugees to a country totally alien to them. They are innocent, not knowing what they are getting into. With offer of material benefits, jobs, availability of services, many have been coerced to convert to Christianity. Not in Central Texas, but in some other parts of the country, a few of those who were converted committed suicide. Another incident is where a Hindu inmate was baptized in a correctional facility! There was no reaching out to temples or Hindu community by the Prison Ministry. We have since then registered a couple of temples to the Prison Ministry. Hindus and Jews do not proselytize. So such incidents, while such practices are common in many parts of India, are disturbing to experience in Central Texas.